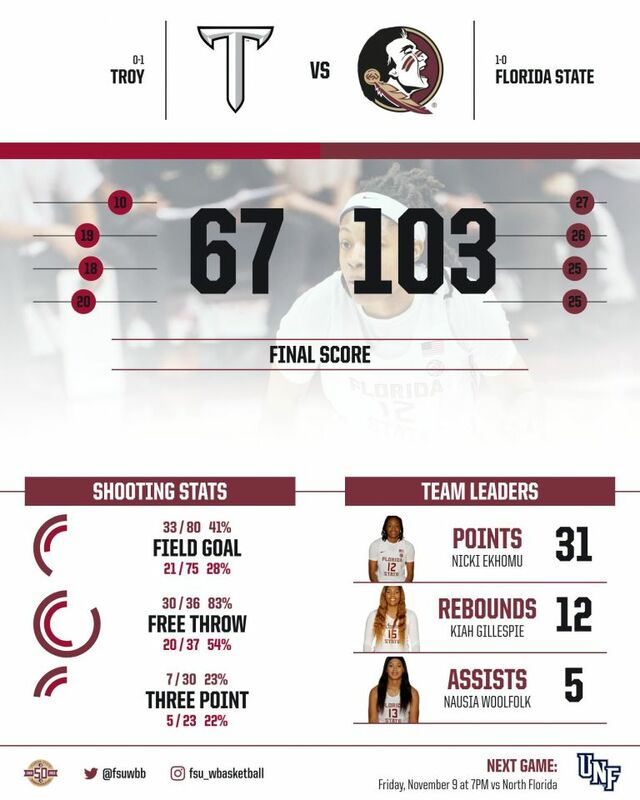 TALLAHASSEE, FLA. (Seminoles.com) – Knowing she has to take on a new leadership role as a junior this season, guard Nicki Ekhomu led by example on Tuesday afternoon with a career-high 31 points as Florida State Women’s Basketball earned a 103-67 victory over Troy at the Donald L. Tucker Center. Tuesday’s season opener was a special 11 a.m. tip-off time with ‘Field Trip Day,’ as over 1,500 kids helped make up the near 4,000 fans in attendance. Ekhomu, a native of Bolingbrook, Ill., went 8-of-12 from the floor and 12-of-14 from the free throw line. Her 12 made free throws was also a career high and is tied for the 15th-most in a game in program history. She added five rebounds, and primarily handling the ball as a point guard, she added three assists to just two turnovers. Ekhomu set the tone for the Seminoles early, matching her previous career high of 20 points by halftime. “This is a group that has a desire to really learn and get better, and as a result of that when they went out today I thought their poise early was the big difference,” FSU head coach Sue Semrau said of her squad. Freshman forward Valencia Myers, a McDonald’s All-American, made a strong debut with 17 points, 10 rebounds and five blocks. The Solon, Ohio, product got her double-double in her opening game and also became the 16th Seminole to produce at least five blocks in a game. Redshirt junior forward Kiah Gillespie filled up the cup with 22 points and a game-high 12 rebounds. Gillespie went 9-of-19 from the floor and had 13 of her 22 in the second half. Playing against a talented Troy team that returned 83 percent of its offense from 2017-18, FSU benefitted by breaking the game open early. A 9-8 lead midway through the first quarter for the Seminoles turned into a 27-8 advantage on an 18-0 run. Florida State made the most of its free throws, shooting 30-of-36. Troy went 20-of-37 from the line, as a combined 58 personal fouls were called (33 by Troy, 25 by FSU). FSU’s defense forced the Trojans into a sloppy offensive performance, as Troy recorded just three assists to 23 turnovers. The Seminoles out-rebounded Troy 63-43 and held a sizeable advantage in the paint at 48-20. Florida State continues its five-game homestand with its second game of the season on Friday, Nov. 9, at 7 p.m. v. UNF. The Fresh From Florida Sunshine Showdown follows at the Tucker Center on Sunday at 3 p.m. against the Gators.